New York - Coinciding with Rare Book Week in New York City, Swann Galleries’ spring offering of Early Printed, Medical, Scientific & Travel Books on March 7 brought bibliophiles from near and far, with breakneck bidding for a number of items, including incunabula and first editions on medicine-but it was illuminated manuscripts that took the spotlight in the sale. Of the impressive run of manuscripts, Tobias Abeloff, Early Printed Books specialist noted: “The market is strong for exceptional material, and we saw significant interest in printed and manuscript Books of Hours, with bidding driving prices over estimates. The biggest surprise of the day was the manuscript Qur’an that went for more than 10 times the high estimate.” The illuminated manuscript in Arabic with miscellaneous chapters of the Qur’an and associated prayers reached $35,000. The sale was led by an illuminated Prayer Book in Latin and French on vellum, France, 1530s-40s, which featured 35 miniatures in color and gold, and sold for $42,500. Additional decorated works included a mid-fifteenth-century Book of Hours in Latin on vellum, France, at $35,000; a mid-fifteenth-century Book of Hours in Dutch on vellum, Northern Netherlands, at $22,500; and Dala’ll al-Khayrat, a 1664-65 illuminated manuscript in Arabic by Muhammad Ibn Sulayman Al-Jazuli, at $5,250. Scientific and medical publications included a first edition of George Agricola’s most important writings on geology, mineralogy and mining, and his monograph on ancient Greek and Roman weights and measures: De ortu & causis subterraneorum Lib. V bound with De mensuris & ponderibus Romanorum atque Graecorum Lib. V, Basil, 1546, 1550, which settled at $11,250. A first separate printing of the first of Wilhem Conrad Röntgen’s three papers announcing his discovery of x-rays, Eine Neue Art von Strahlen, Würzburg, 1895, was sold for $5,200. Andreas Vesalius’s 1604 Anatomia, Venice, a landmark treatise on human anatomy, brought $5,250. A 1737-38 first edition of Icon durae matris in concave [convexa] superficie visae, Amsterdam, by Frederick Ruysch with two color mezzotints by Jan Ladmiral earned $5,250. Incunabula featured Marcus Valerius Martialis’s Epigrammata, Venice, 1485, with commentary of Domitius Calderinus, which brought $7,500, Quaestiones de duodecim quodlibet, Venice, 1476, by Saint Thomas Aquinas that earned $6,500, and Marcus Anneaus Lucanus’s Pharsalia, Venice, 1486, with commentary of Omnibonus Leonicenus garnered $5,000. “The finest edition of Don Quixote that has ever been printed,” a first Ibarra edition of Cervantes’s El Ingenioso Hidalgo Don Quixote de la Mancha … Nueva Edición, corregida por la Real Academia Española, Madrid, 1780, in four volumes, exceeded its high estimate bringing $11,875. Additional highlights included a first edition of one of the scarcest early Italian chess manuals, and first book printed in Militello, Il Gioco de gli Scacchi, by Pietro Carrera for $10,625. The True Prophecies or Prognostications, London, 1672, a first complete edition in English of Michel de Nostradamus’s quatrains supposedly predicting historical events, garnered $5,750. The next auction from Swann Galleries’ Books & Manuscripts Department will be Autographs on March 21. Visit www.swanngalleries.com or download the Swann Galleries app for catalogues, bidding and inquires. 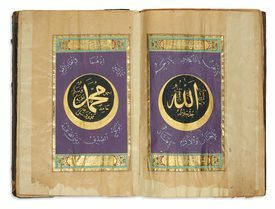 Image: Lot 169: Illuminated manuscript in Arabic, miscellaneous chapters of the Qur’an with associated prayers, Ottoman. Sold for $35,000.